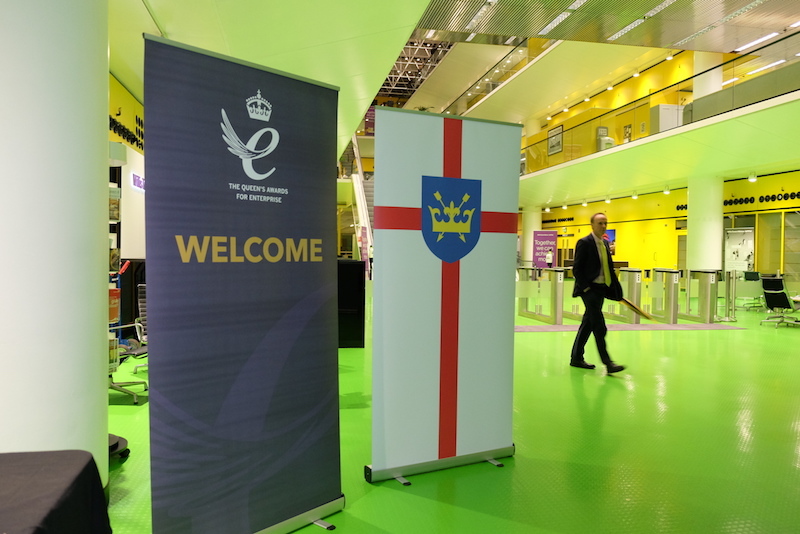 Last night a special event supported by Spring was held in Ipswich to encourage Suffolk businesses to put themselves forward for the Queen’s Awards for Enterprise. These awards are designed to recognise and encourage outstanding achievements in five categories: Innovation, International Trade, Sustainable Development and Promoting Opportunity through social mobility. They are the most prestigious awards in British industry, and winners report benefiting from worldwide recognition, increased commercial value, greater press coverage and a boost to staff morale. Winners are invited to a royal reception and presented with the award at their company by a Lord Lieutenant. Spring supported the evening by designing the brochure and other artwork for the event. We chose a deep blue and gold palette which conveyed the nature of the awards, and paired it with a clear uncomplicated font that could be read easily and had a wide range of weights and styles for different applications. The brochure celebrates previous Suffolk winners, explains how to apply and shows what is to be gained from winning a Queen’s Award for Enterprise. Suffolk has 60% more businesses per 1,000 people than the national average, and those businesses are more likely to turnover £1m and survive for five years or more, so it is only right they should be recognised with the top awards.